Hey all of you readers of The Oregon Wine Blog! I’m Jill, a friend the non-snooty bloggers who you know and love and the new Culinary Specialist on staff. I only recently developed a love for wine after moving to Washington state four years ago. I grew up in Wisconsin, the land of cheese, beer, and the Packers; you don’t see much wine at Lambeau on game day! Prepare asparagus cutting off bottoms of stalks that are too woody or thick. Slice into 1 inch sections. Heat olive oil over medium heat in a non-stick skillet. Add garlic, salt, and both peppers. Saute for 2 minutes. 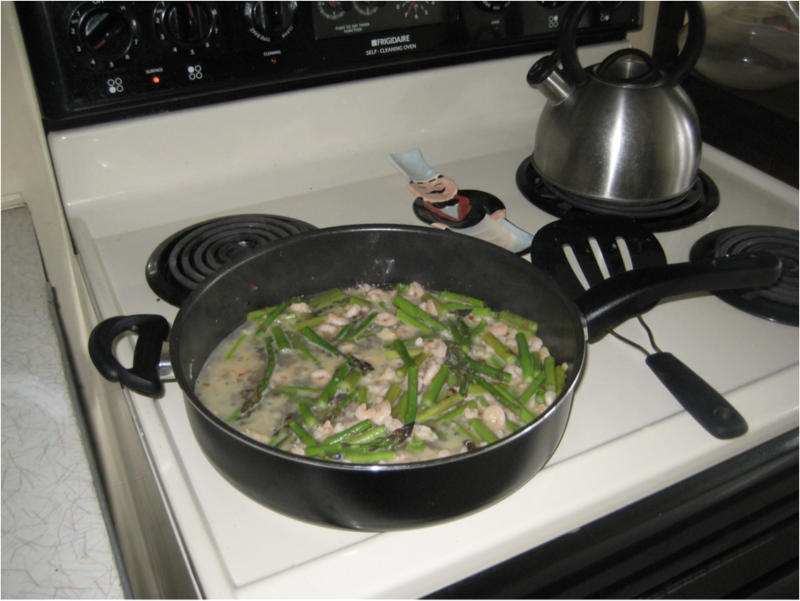 Add asparagus and continue cooking for 3 more minutes. Stir frequently. Add shrimp and cook for 4 minutes. Add chardonnay. For this recipe, I used Columbia Crest Two Vines Chardonnay. The apple and pear flavors of the wine really worked with everything else. Bring the chardonnay for a boil for 3 minutes. Then, turn down to medium low heat, and simmer for another 10-15 minutes to let the flavors grow. Slice the baguette into 1 inch slices. Put in oven or toasted until lightly toasted on both sides. Remove everything from heat, and put into shallow dishes or bowls. Use bread to enjoy the lovely juices. Make sure to buy the thinnest asparagus possible. 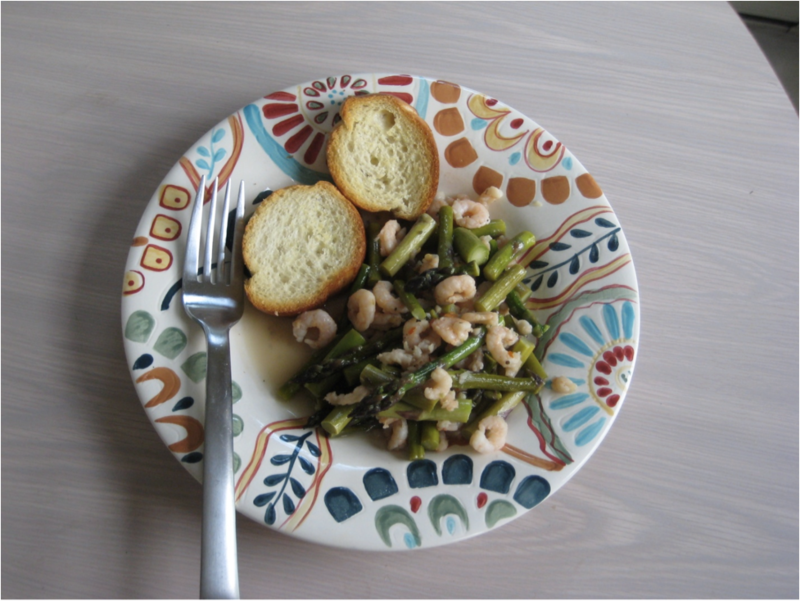 The thicker asparagus is, the woodier the texture and flavor. Also, the cooking time may vary once the wine is added. If you have very thin asparagus, it may be less. Continue to sample the asparagus as you go to make sure it isn’t getting limp or mushy. You can also add lemon juice for added flavors in this recipe. Start with a dash and work up if you like the flavor. The Pampered Chef garlic press is probably one of the greatest things I have ever been given. It’s a garlic press that doesn’t require you to peel the garlic before you press it. I usually just press garlic through this rather than actually taking the time to mince it. That looks great, we will have to try the recipe. A great addition to the blog!